Photo-Journal Guide to Marvel Comic Books, The Two Volume Hardback Set (Gerber Publishing, 1991). Nice, unused copies of the Marvel two-volume set, featuring cover illustrations from the complete Silver and Bronze Age run, and beyond. 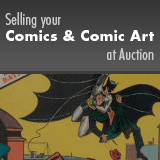 A fantastic resource for collectors! These books appear to have never been read. Not listed in Overstreet.